I think the hotel has one of the best locations in Vathy town. Most rooms have the beautiful view of the harbour and the sea. Employees are kind and helpful. The breakfast buffet is rich and appeal to different breakfast preferences. Very good price/quality ratio. Mr Akis from reception! He made our stay great with his recommandations about Samos and he was very helpful when we wanted to change our room. Special thanks to Mrs. Maria from reception desk. She let us early check in and late check out. So we could use the room until our boat's boarding time. Breakfast was good. Sea front rooms are not big but it is ok. Worth seeing sea view. Customer friendly reception staff is good. Location is perfect. It is in front of Vathi seaport and only 1 minute walk from port to hotel. Breakfast was good BUT even going down very early .. the supposedly hot food was COLD. It was fair. Coffee beverages and food was enough and the quality and quantity good. Breakfast was good. Location was great. Friendly staff. Staff very friendly and helpful, great location and good breakfast. Samos Hotel This rating is a reflection of how the property compares to the industry standard when it comes to price, facilities and services available. It's based on a self-evaluation by the property. Use this rating to help choose your stay! 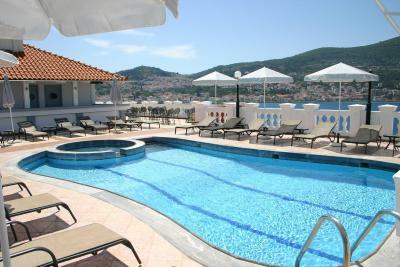 Located in Samos capital, Vathy, Samos Hotel offers air-conditioned rooms with balcony and free Wi-Fi access. It has a swimming pool, while the beach of Gaggou is 1,650 feet away. 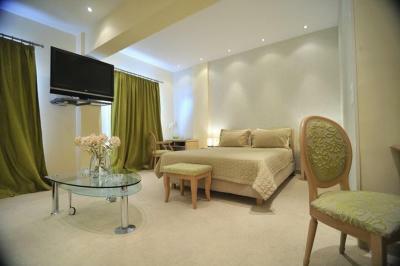 Hotel Samos rooms are soundproofed and tastefully decorated in soft colors. They are equipped with satellite TV, refrigerator and hairdryer. 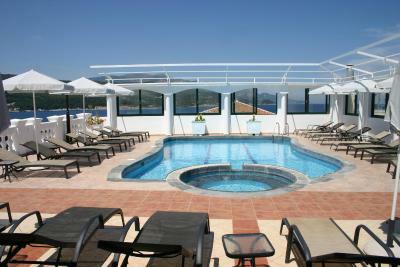 All rooms have balconies, most with views to the Aegean Sea. Guests can take a refreshing swim in the swimming pool of Samos Hotel or relax at the sun terrace with a drink from the pool bar. At Samos café, guests can enjoy their coffee or desert overlooking Vathy bay, while snacks are prepared throughout the day. The hotel also features a multi-purpose hall, which can accommodate conferences and social events. A halfboard menu is served to guests who have made a reservation including halfboard. Samos Hotel is within walking distance from the capital’s center, while Samos airport is 9.3 mi away. Free parking is available near the hotel. 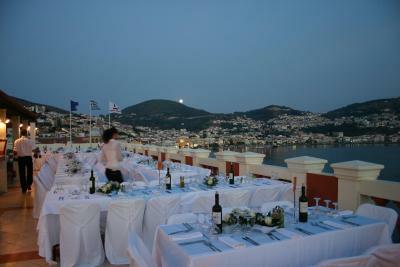 When would you like to stay at Samos Hotel? This suite has a sea-view balcony, a spa bathtub and a 42-inch LCD TV. House Rules Samos Hotel takes special requests – add in the next step! Samos Hotel accepts these cards and reserves the right to temporarily hold an amount prior to arrival. The size of the bathroom shower is a joke... it is impossible to have a shower and not get the whole bathroom floor soaking wet. Very bad design. Perfect location, nice view, good breakfast. There were blood stains on sheets and Towels. Also there were hair on bathroom. The cleanness is no good. But we have stayed for just a nite. Location is good, staff is polite.